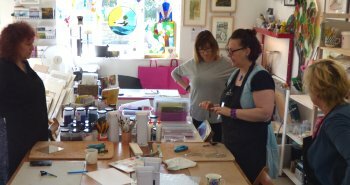 This one-day class will introduce you to the basics of glass tack fusing and you'll make your own coloured 28cm high lantern! The class begins with a discussion of the concept of glass tack fusing (sometimes called contour fusing), discussing common issues and a review of the materials you'll use. You may like to come up with some basic design ideas, or we can help you on the day. There'll be a wide range of glass frit, glass noodles and enamel pens for you to create your lantern glass panels from. 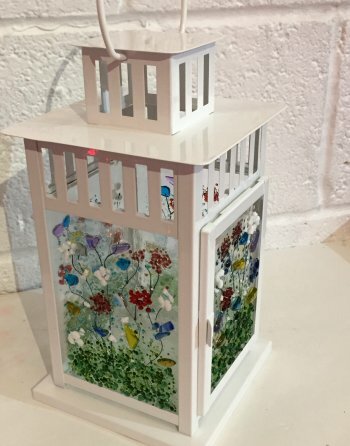 You'll be creating 3 decorated glass panels to replace the plain glass supplied with the lantern. The glass panels will be fused as a single layer of fusible glass at around 750 deg.C, retaining the texture of the frit and other glass materials you use to make your design. As the panels for your lantern need to be kiln-fired overnight and allowed to cool slowly, we'll contact you when fired so you can collect. We'll show you how to assemble the glass panels in to the lantern. 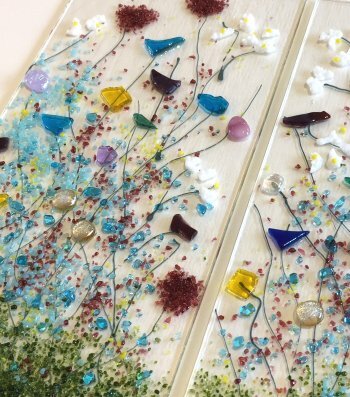 Tack fusing is fast becoming a popular art form and this class will give you an inspiring introduction to the exciting world of fused glass! If you're ready to book, choose the date you prefer and use the PayPal buttons to make your booking. You can pay by card or PayPal. We can also take bookings in the studio. 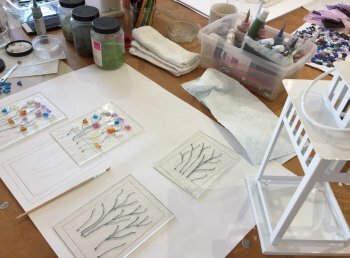 If you'd like to receive our monthly newsletters with updates on new class dates and types, plus all sorts of fused glass and stained glass information, click here and subscribe. Decorate your own beautiful coloured glass lantern in one day! "Should be made available on NHS for its impact on well-being!" "Great day to spend relaxing and being creative"
"Fantastic course. I am a complete beginner to any arts and crafts and I managed to achieve a finished product I am proud of."